Abstract: Optical science and technology has touched many areas of science, engineering and technology. A few of these areas will be highlighted with an emphasis on some current developments. Biography: Steven Chu has recently returned to Stanford University as Professor of Physics and Molecular and Cellular Physiology. From January 2009 until April 2013, Dr. Chu served as the 12th U.S. Secretary of Energy during President Obama's administration. Prior to his Cabinet post, he was the Director of Lawrence Berkeley National Lab, Professor of Physics and Professor of Molecular and Cell Biology, University of California Berkeley and Professor of Physics and Applied Physics at Stanford University. Previous to those posts, he was with AT&T Bell Laboratories. During his tenure, DOE had an annual budget of approximately $26 billion, and was entrusted an additional $36 billion through the Recovery Act. 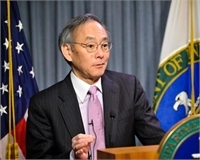 During his tenure, DOE began ARPA-E, the Energy Innovation Hubs, the Clean Energy Ministerial and several other initiatives, and helped double the deployment of renewable energy in the U.S.
Dr. Chu is the co-recipient of the Nobel Prize for Physics (1997) for his contributions to laser cooling and trapping of atoms. His other areas of research include tests of fundamental theories in physics, atom interferometry, study of polymers and biological systems at the single molecule level, and biomedical research. While at Stanford, he helped start Bio-X, a multi-disciplinary initiative that brings together the physical and biological sciences with engineering and medicine. More recently, he has focused on how to transition to a sustainable future. Dr. Chu is a member of the National Academy of Sciences, the American Philosophical Society, the Royal Academy of Engineering, the Academia Sinica, the Korean Academy of Sciences and Technology, and is an honorary member of the Institute of Physics, the Chinese Academy of Sciences, and a Lifetime Member of the Optical Society of America. He received an A.B. degree in mathematics, a B.S. degree in physics from the University of Rochester, and a Ph.D. in physics from the University of California, Berkeley, and 23 honorary degrees.